The dual openings at the top of the reservoir allow for inserting the hose from the right as well as from the left. And the display will show you the remaining time of the working cycle. Rather bulky and requires a lot of storage space. This innovative fully-automatic equipment will destroy up to 99% of bacteria, viruses, and mold that reside in a CPAP cleaner, masks and hoses. Thanks to its large dimensions, it is compatible with all models of face masks. The built-in battery will serve you for 10 years easily, which makes this device a worthy investment. One full charge will provide you with up to 7 cleaning cycles. An unpleasant smell lingers in the mask right after the cleaning. 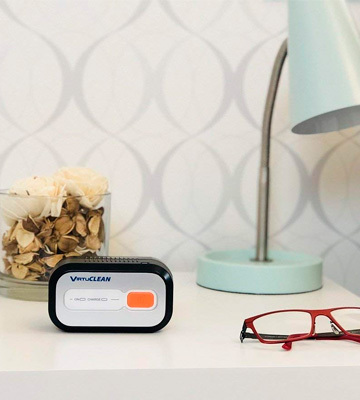 This compact portable cleaner and sterilizer for CPAP equipment requires about as much space on your bedside table as your glasses do. It doesn't need water or cleaning detergents and can be charged via a USB cable. It's a truly high-tech and compact option. The device only requires batteries to work which, coupled with the compact size, makes it a good portable option. The placement of the power switch is rather inconvenient. 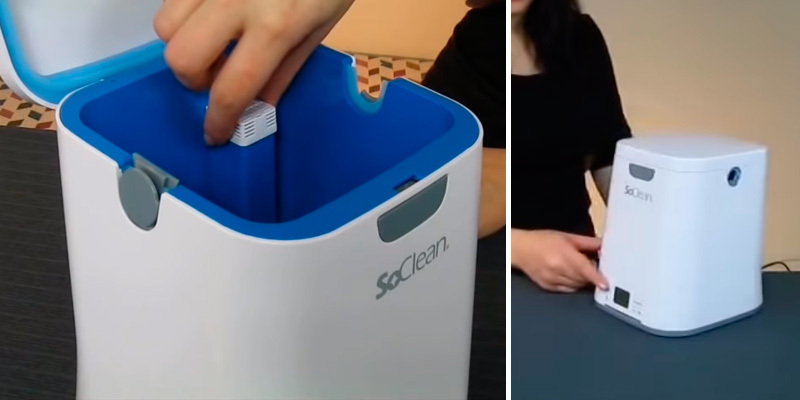 The SoClean SC1300 is a portable cleaner for automatic disinfection of CPAP devices and their accessories at home and on trips. It breaks down all the microorganisms using ozone, without leaving any smell. It's practical and easy in use, great for effortless CPAP maintenance. 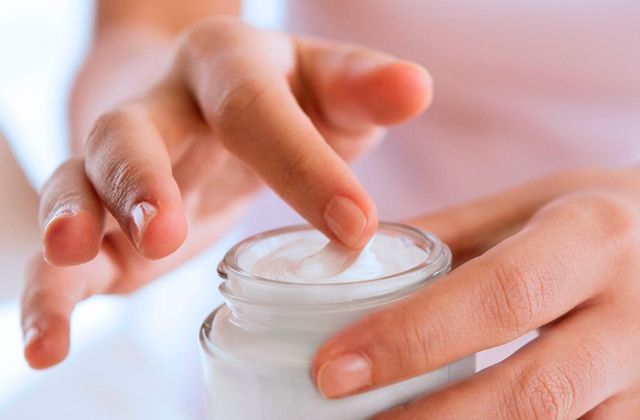 Depending on your needs, you can choose one of the two cleansing cycles - 20 minutes or 30 minutes long. Plus, at the end of each cycle, fresh air will blow to get rid of odors. The manual is not really detailed. 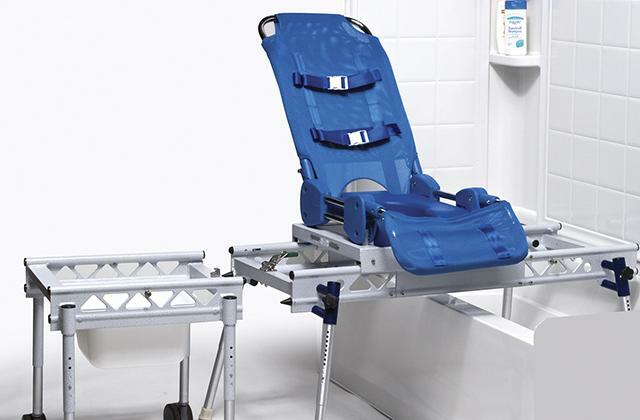 This is the perfect choice for those who are looking for a fast and effective disinfector for their CPAP equipment as one full battery charge is enough for 10 cleaning cycles. 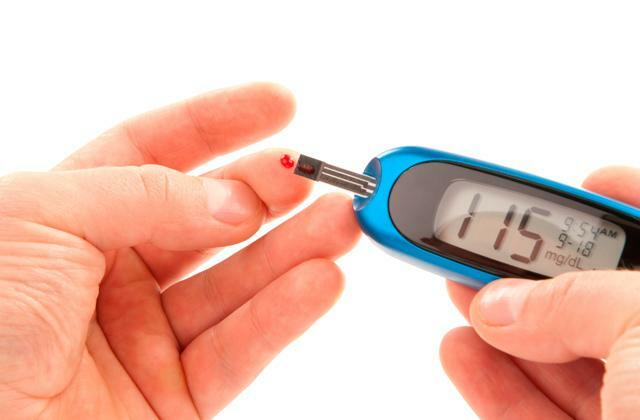 The device is portable and, thanks to the convenient case, you won't have to worry about its safety. 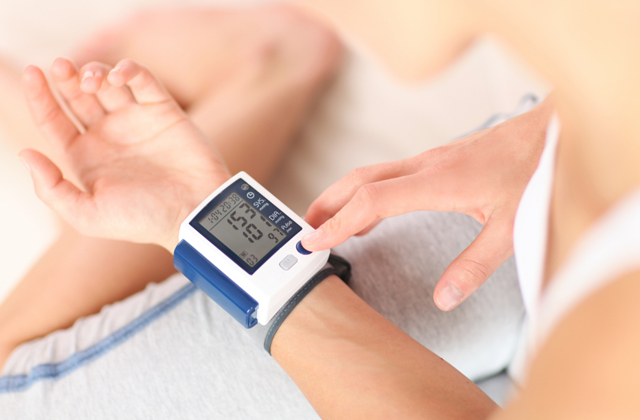 The device buzzes three times after ending the cycle so you know when the work is done. The travel case is not included. The Scenstar Sanitizer is a small and affordable cleaner that is suitable for cleaning CPAP tubes with a diameter of 22 mm. It will become handy both at home and on the go although it does have limited use. Still, those whose CPAP equipment fits this cleaner will be happy to buy it at such a bargain price. If you plan to use your cleansing machine only at home, there is no better model than the SoClean SC1200-S10K. 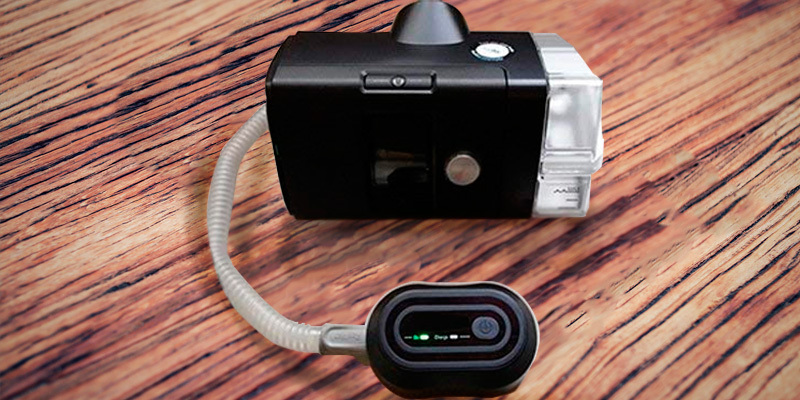 The bundle includes a SoClean CPAP cleaning machine and an adapter. This cleaner and sanitizer kills up to 99% of harmful germs and bacteria in your CPAP mask, tubes, and reservoir. It requires no water or cleaning chemicals since it uses natural activated oxygen to sanitize and disinfect your equipment. You won’t have to dry your tubes, so they will be ready for use straight after the cleaning. Plus, the system of the filter change is very straightforward, so you won’t have any hassle with the use. The unit is fitted with a large chamber of 13 x 11 x 11 inches, hence it's already compatible with masks of various sizes (with the exception of the masks that cover your entire face). Two openings on the top of the reservoir allow inserting the tubes from the right as well as from the left side. The procedure of cleaning takes two hours, which is on the longer side but the quality is worth it. And the LCD display will allow you to monitor the time remaining in the cycle. 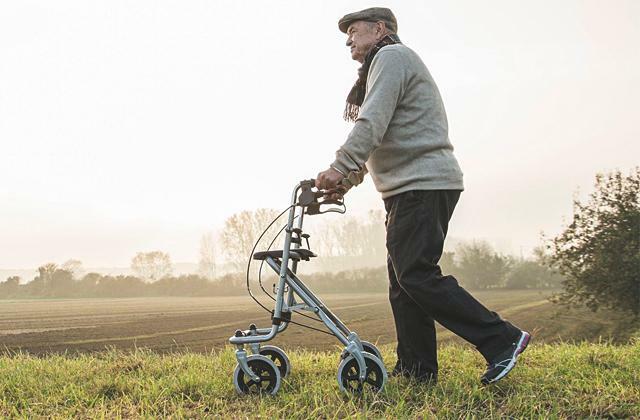 The model is stationary and is designed for home use. The appliance works from an outlet and comes with an 8-foot cord. Yet, keep in mind that this model is pretty heavy and large. 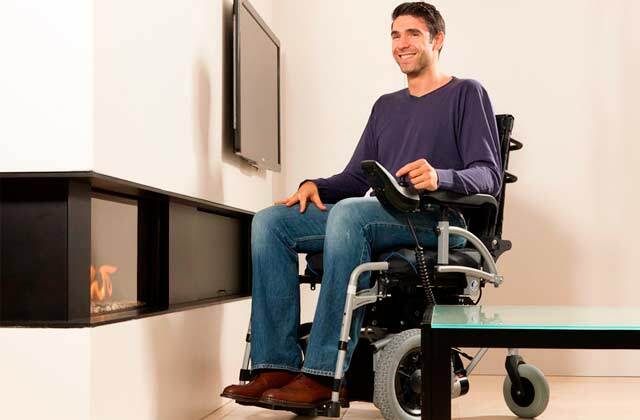 Hence, some users may find it hard to find a space for the unit due to its bulkiness. In short, if you need a safe and convenient-in-use sanitizer, look no further. 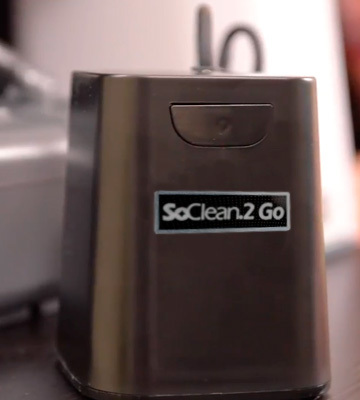 The SoClean SC1200-S10K is the best CPAP cleaner for home use. The most appealing thing about the VirtuCEAN 2200 is that it's compact and lightweight. It requires just as much space on your bedside table as your reading glasses. This unit is portable and works on a rechargeable battery. 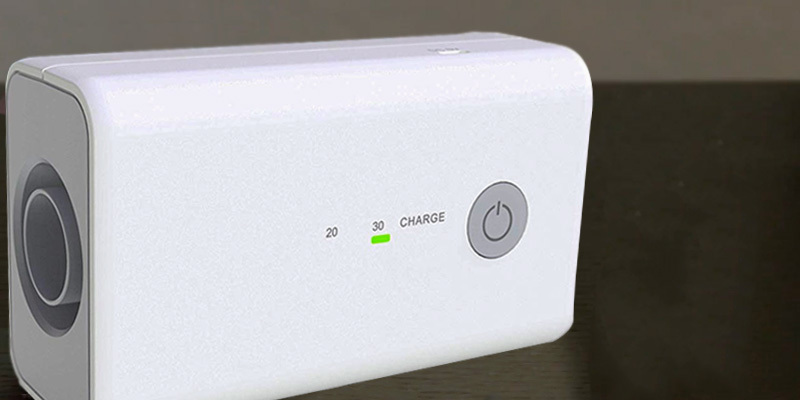 A single full charge should be enough for about 7 cleaning cycles and the device can even be charged with a standard USB cable (included). 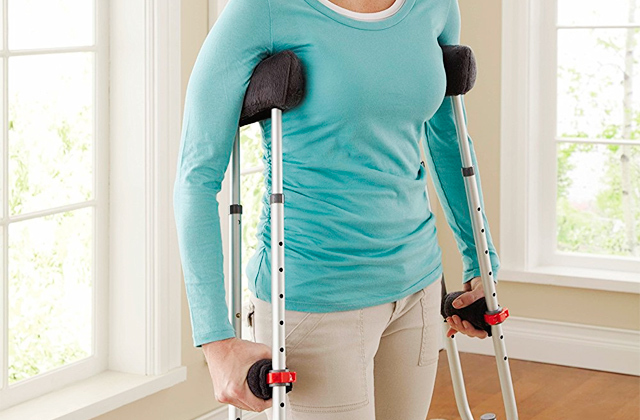 The robust accumulator will serve you for 10 years and more, which, combined with the 18-month warranty, makes this device a safe investment. The kit is very generous and includes an adapter in an eye-catching orange color, 4 filters, 2 standard tubes, a case, and, as mentioned before, a USB charging cable. The VirtuCLEAN 2200 is a waterless automatic cleaner that doesn’t require any soap or other detergents. 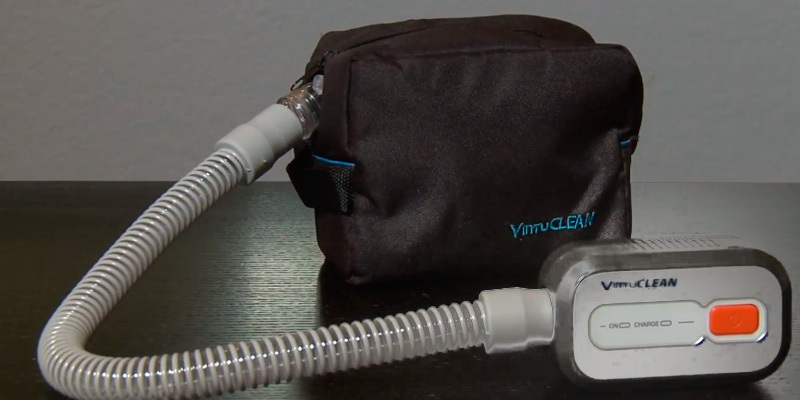 The device is using Ozone (activated oxygen) to thoroughly clean your CPAP tubes, mask, or water chamber. Thus your equipment will stay dry, eliminating the risk of mold. The other main advantage of this unit is that it is very compact and light, which makes it portable. Thus, even when you go travel, your CPAP machine will stay disinfected and safe for use and you won’t have to waste any time cleaning. So, if you are looking for a small yet effective unit that will make cleaning your CPAP machine a breeze, this is a good fit for you. The device is portable and easy to carry around, so your apnea therapy will be safe wherever you go. 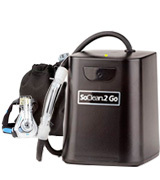 The SoClean SC 1300 is a smaller (and more affordable) version of the standard SoClean CPAP sterilizer. It is easier to carry with you, yet it doesn’t lag behind in terms of the functionality and cleaning performance. This sanitizing device breaks down all the microorganisms using Ozone, without leaving any smell. The cleaning session lasts for two hours, which you can spend on your other business. The sterilizer will take care of your CPAP supplies. The device is battery operated and works on 8 AA batteries (that come with the set). With it, you won’t have to deal with charging cables or look for an outlet. 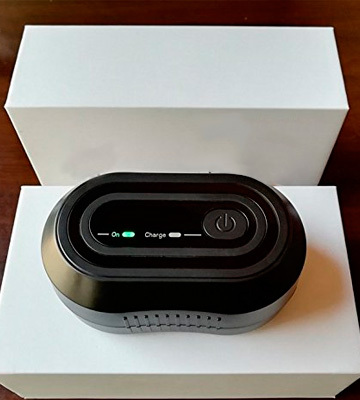 So, if you’re planning to go on a trip and you’re not sure if you would have an easy access to electricity, this travel CPAP mask cleaner will be a great companion. It is quite small, yet the chamber is big enough to fit your mask and clean the tubes for safe airing. The only problem you may face when using this disinfector is that the power button is situated rather inconveniently, but it’s only a matter of time until you get used to it. In conclusion, if you need a portable CPAP sanitizer that will thoroughly clean your machine and kill all the germs and mold, the SoClean SC1300 will tackle with this task perfectly. 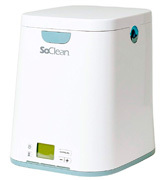 The SolidClean is a small portable unit to keep your CPAP apparatus disinfected and sanitized. With the dimensions of 2.6 x 4.6 x 1.6 inches and a weight of only 0.44 lbs, you will have no trouble carrying it around. To clean the machine properly, you need to connect your tubing to the cleaning system and put the mask into a case (included in the kit) and press the power button. And for humidifier disinfection, connect the air tube to the sanitizing machine and to the сleaner. It will pump the Ozone through the hoses and kill all the bacteria. You also can choose the time of the procedure (20 or 30 minutes, quite speedy). After the session, your CPAP device will be 99% clean while you can spend your time on other stuff. Just bear in mind that some hoses require a special adaptor to be connected to the cleaning machines. 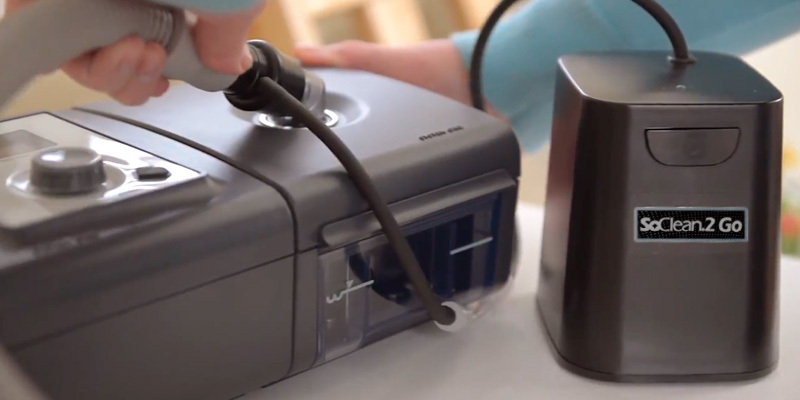 The minor con of this CPAP cleaning machine is that the instructions could be clearer, hence if you have any trouble with using it, you may have to contact the manufacturer or do some additional research. 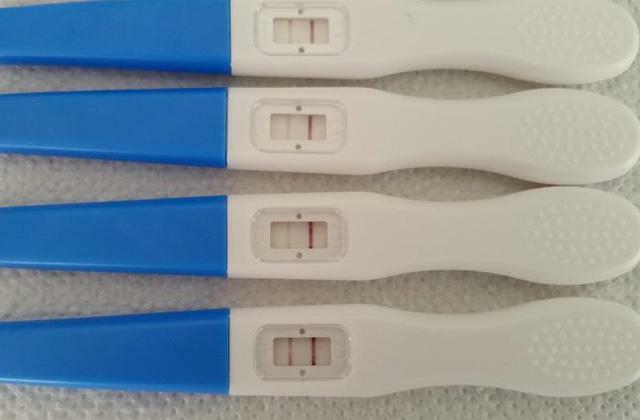 Yet, we hope this minor disadvantage won’t be a dealbreaker for you. 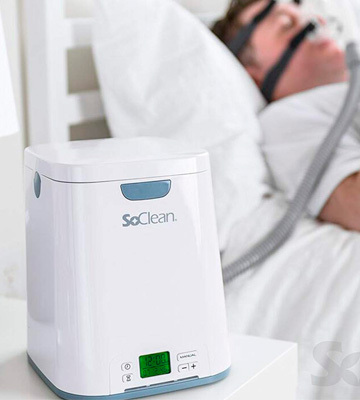 In short, the SolidCLEANER is the best CPAP cleaner for use on the go due to its small size and low weight. 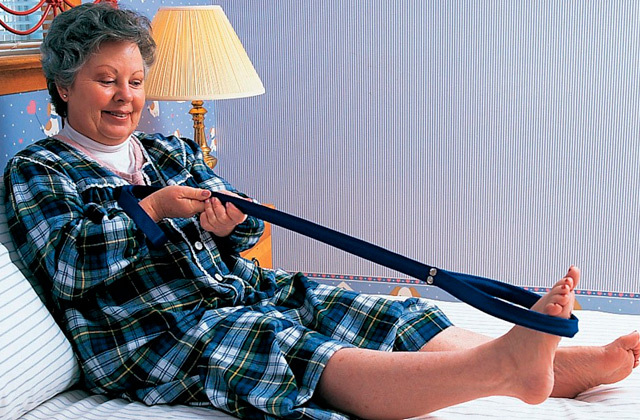 Consider buying this product if you want your sleep apnea therapy to always be safe. 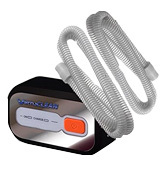 The Scenstar CPAP Cleaner and Sanitizer is an automatic device that will disinfect your CPAP equipment and spare you from long hours cleaning and trying to reach all the awkward spots. 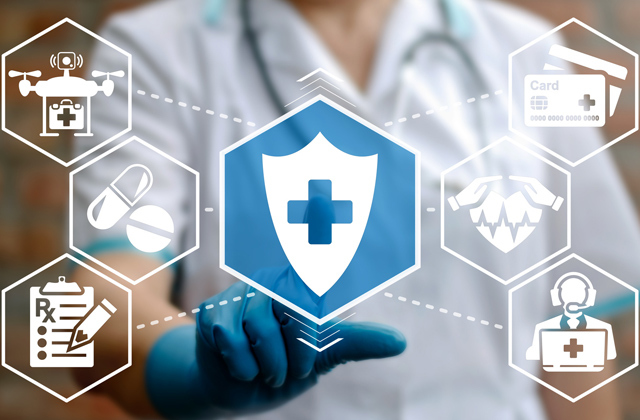 The device is quite simple and small, yet it has a good performance and kills all the germs and bacteria in your mask, water reservoir, and tubes. Note that it is suitable for cleaning CPAP tubes with a diameter of 22 mm. 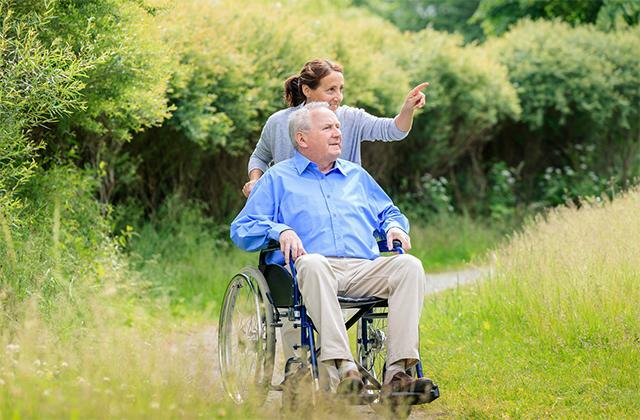 It is very convenient in use thanks to the one button operation and the alert system that will inform you about the end of each 25-minute cycle with a short buzz. You also will notice the indicator lights on the unit while it’s working. The device is battery operated and can be charged via a USB cable that's included in the set. This model also comes with a power adapter. It will become handy both at home and on the go. Just keep in mind that the travel case is not included. This mini sanitizing device also boasts an appealing price, so if you are on a shoestring budget yet need a way to clean your CPAP equipment, this model is the best solution for you. The Scenstar CPAP Cleaner and Sanitizer is a great cleaning machine that will meet all your expectations. It is convenient in use, compact, affordable, and, most importantly, thoroughly cleans your CPAP machine. 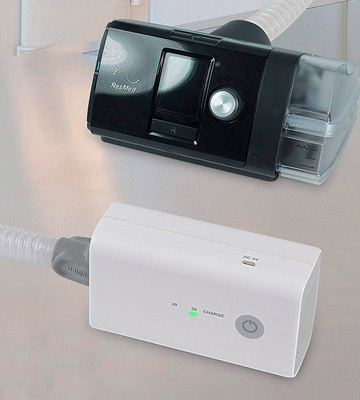 The CPAP machine is used for sleep apnea therapy, and it is very important to keep it clean in order not to catch colds and other nasty infections and viruses. 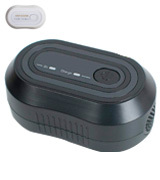 The CPAP cleaner is a device that helps to sanitize and disinfect your CPAP equipment. Such a tool will make the process of cleaning easy and hassle-free. You’ve probably heard about various CPAP cleansing wipes, but the advantage of using CPAP cleaner over cleaning the device manually lies in the fact that it is able to eliminate almost 100% of harmful germs and bacteria that reside in your breathing mask and tubes even in the most hard-to-get places. The CPAP cleaners come in stationary and portable options, so you could sanitize your equipment even during vacations and trips. It is crucial to remember that your CPAP equipment should always be dry since even a drop of water can cause mold and bacteria to spread. Hence, try to pick up a CPAP cleaner that will dry your mask and hose perfectly or won’t get them wet while cleaning in the first place. So, if you want your breathing procedures to be safe and effective, check out the following cleaners. And if you want to sleep comfier during your apnea sleep therapy, we recommend buying one of the five best sleep masks.